Originally titled Justin Reads Boring Documents, I’ve taken to live-tweeting as I read various otherwise boring documents, like the Australian National Audit Office (ANAO) report into the Integrity of Medicare Customer Data from 2014. I needed a hashtag without too much overlap/clash with others, and someone suggested Too Long; Justin Read, or #tljr, and I quite liked it so that’s what I use now. The trouble with live-tweeting is that it’s ephemeral, and if you’re not there at the time, you can miss out on whatever was said. I auto-delete my tweets, too (because I like to reinforce the ephemeral nature of the medium) so to archive what I said, I’ve taken to using Storify. Here’s the one on ANAO’s Integrity of Medicare Customer Data. And one of several as I read the Senate Inquiry report into the Centrelink #notmydebt debacle. Firstly, I find it fun. Weird, huh? Doing the live tweet thing makes something that would otherwise be a solitary activity into a social activity. I can chat to people about what I’m reading, clarify questions, and generally discuss the material as I read it with people who might be interested in the topic, but don’t want to read the whole thing themselves. I have at least a passing interest in the topic, so I’m generally learning something as I go. Tweeting about it at the same time is like making notes on the material, only in public. Note taking helps me to remember things better, and doing it on Twitter means other people help me to learn as well. I get asked questions about nuance and detail as I go, and sometimes people chime in with links to other relevant material that provides extra context or background. It’s a lot like a study group. Secondly, it’s really good practice at reading comprehension and summarisation. A lot of my day job involves communicating complex ideas to other people, and doing it quickly and well is an important skill. Skills get better with practice, so this helps me do my job better. Getting a core idea from an entire paragraph down to 140 characters, or linking an argument together with a series of short, clear statements (without writing an entire essay) is tricky, but it gets easier with practice. It also takes skill to make a somewhat dry subject interesting. Doing a #tljr on something means I practice a bunch of communication skills all at once, which I find fun, and it makes me better at my job. It turns out that there are plenty of people that are interested in what you might think are boring topics. Not everyone is, and that’s fine, because reading along is optional (you just just mute the hashtag if you follow me but don’t want to see this stuff). Part of the reason I’ve kept doing them is that other people seem interested. Yes, I do them mostly for my own benefit—I find it fun! Intrinsic motivation is a thing!—but the fact that other people like them and join in adds some extrinsic motivation to the mix. Of course now I need a logo and merch and a Patreon because that’s what all the cool kids are doing, right? 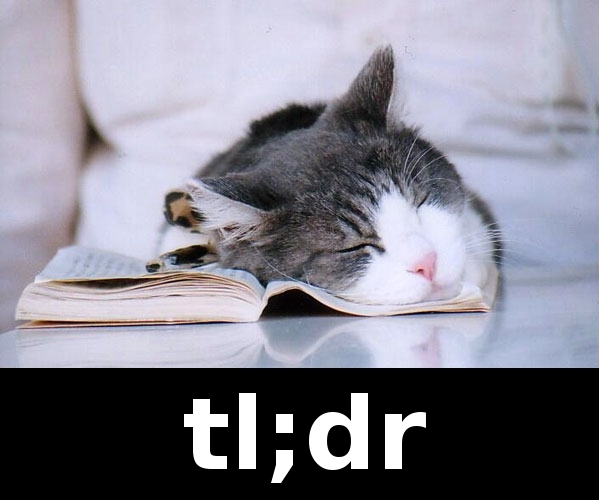 You’ll have to watch out that autocorrect doesn’t, as it did in this story, change your tag to #tldr. Aha! Auto-finger-correct in this case.